Frederick Griffith, established that there was a transforming principle in bacterial genetics in a ground-breaking experiment, performed in 1928. He postulated that information could somehow be transferred between different strains of bacteria. This was long before the discovery of DNA and was an inspired piece of scientific detective work. For this study, Griffith used two strains of Pneumococcus bacteria, type III-S and type II-R. There is one major difference between these two types; the III-S strain has a smooth polysaccharide coat which makes it resistant to the immune system of mice, whereas the II-R strain lacks this coat and so will be destroyed by the immune system of the host. 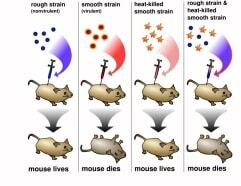 For the first stage of the transforming principle experiment, Griffith showed that mice injected with III-S died but when injected with II-R lived and showed few symptoms. The next stage showed that if the mice were injected with type III-S that had been killed by heat, the mice all lived, indicating that the bacteria had been rendered ineffective. The interesting results came with the third part of the experiment, where mice were injected with a mixture of heat killed III-S and live II-R.
Interestingly enough, the mice all died, indicating that some sort on information had been passed from the dead type III-S to the live type II-R. Blood sampling showed that the blood of the dead mice contained both live type III-S and live type II-R bacteria. Somehow the type III-S had been transformed into the type III-R strain, a process he christened the transforming principle. Follow up experiments performed by Avery, McLeod and McCarty and by Hershey and Chase established that DNA was the mechanism for this transferal of genetic information between the two bacteria. In turn, this lead to the discoveries of Crick and Watson, who discovered the exact structure of DNA, and the mechanisms used for storing and transferring information. Considering that Griffith did not know the chemical and biological processes behind the transforming principle, it was inspirational research which built on the theories of scientists such as Mendel. The study opened up avenues of research into the biochemical principles behind the genetic transference of information. Genetic engineering, involving the transferring of DNA between organisms, is now more commonplace, but built upon the research performed by Griffith. Most biology students have heard of Mendel, and Crick and Watson, but must not forget the work of the other inspiring scientists in between.